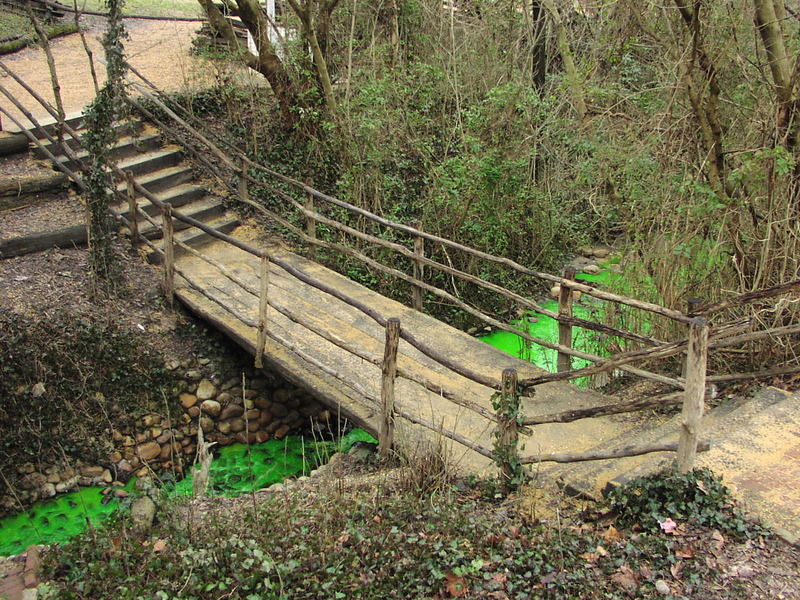 We dyed the Stream that runs under our shop. We had a busy last week. Last Thursday, the shop delivered the Monticello pieces from the January woodworking conference a year ago. It was a rain drenched day. The kind that make sailors miss the open sea. In other words, it was really wet. But, we prevailed and the goods were delivered without any remorse or damage. We made some alterations from the actual table. We used cherry instead of the original’s mahogany. Jefferson referred to cherry as”the poor man’s mahogany” for its similarity in color and lower cost. With two coats of linseed oil/turpentine, then Beeswax/ Venice turpentine and elbow grease; We also fabricated the book rest that inserts into the 3 small brass plates seen on the front edge of the writing surface. We also left off the short cross bracing attached to the long stretchers. The conclusion was that these were later additions. 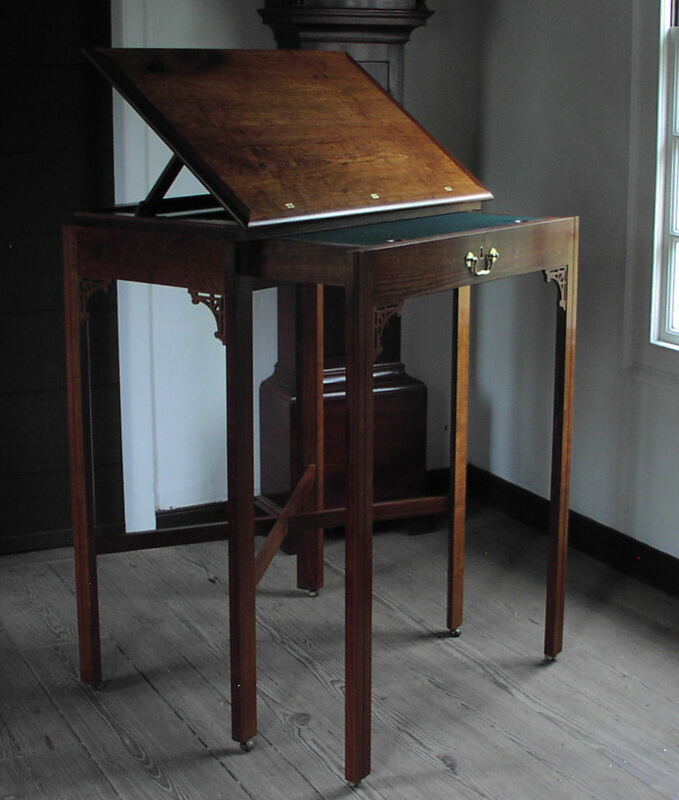 The Writing Table Kaare recreated here is not on public display at Monticello presently. The column is similar to one in the parlor so perhaps made in the same shop. The table is mahogany through and through. Kaare wiped down the table with linseed oil/ turpentine, then finished with a couple dozen coats of seedlac. 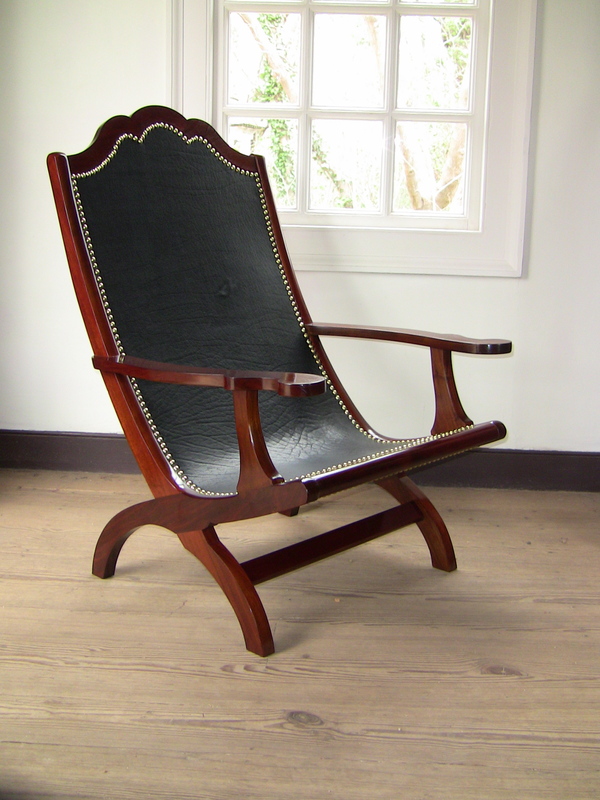 This urban version of a Campeche chair Bill recreated is a copy of a mahogany original. 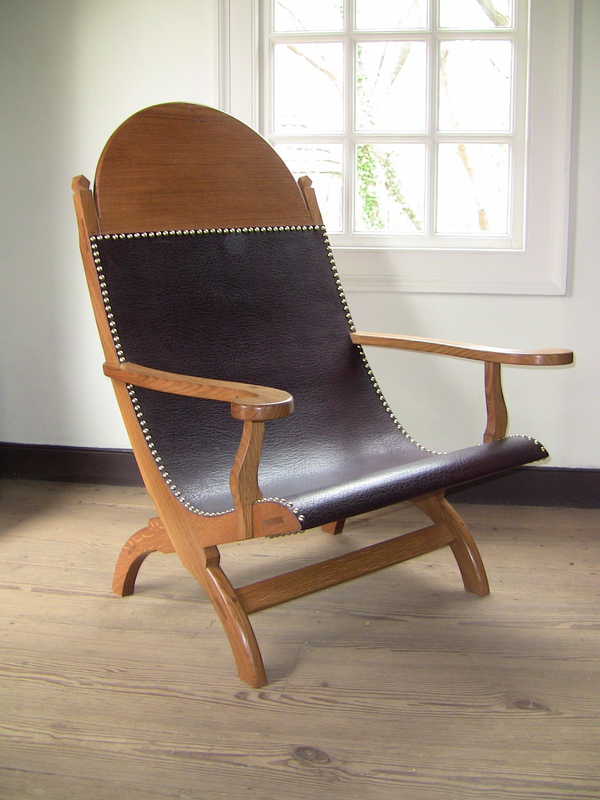 Our’s is constructed from walnut with beech tack strips to attach the buffalo hide leather.The chair was also wiped with linseed oil/ turps followed with roughly 16 coats of seedlac. I would also like to point out that all those brass tacks you see were hand polished by Bill. This rustic joiner’s style oak Campeche is a composite of several chairs Mack and Bill studied at Monticello. With the idea towards design, what makes a campeche chair comfortable. Unlike the walnut chair, this one was finished with 3 coats of linseed oil giving a softer reflective surface than seedlac. If you’re interested in seeing the Monticello pieces, go to http://www.monticello.org and either take a virtual tour of the house, go to their collections. Bill and I will be posting additional information about our pieces sometime in the future. Now that we’ve closed our Thomas Jefferson chapter, we’d like to mention what a great experience it was to work with the Monticello people. Their generosity in allowing us to study these furniture pieces was greatly appreciated. A special thanks to Bob Self and Susan Stein for answering all our question and especially Bob for getting up so early and opening up the house before the guests arrived. 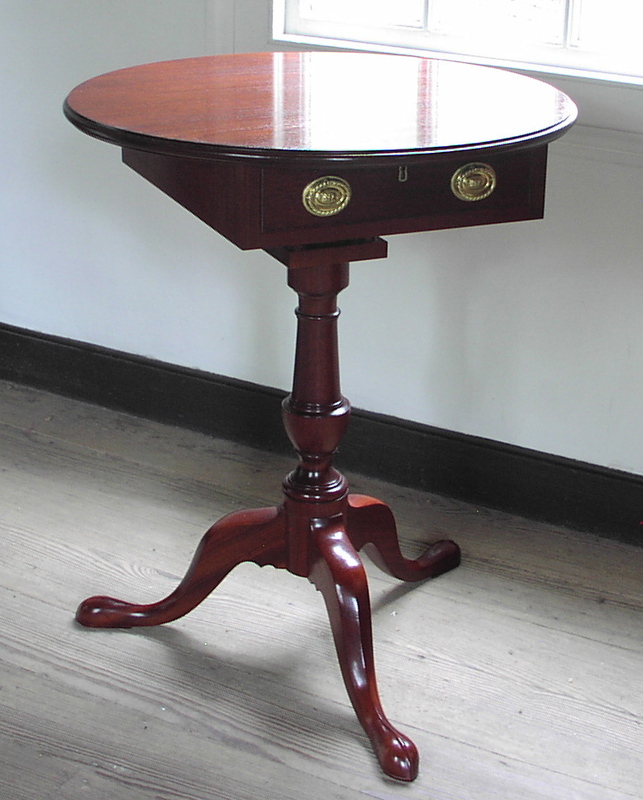 This entry was posted in Chairs, Desks, Tables and tagged Campeche Chair, Colonial Williamsburg Cabinet Shop, Drawing Desk, Handtool Woodworking, Monticello Furniture, Pedestal Table. Bookmark the permalink. I found your comments on the finishes you used very interesting. Do you use boiled linseed oil? I would be very interested on any additional information on the finishes, how they are mixed and applied. About a week ago I was talking to Rich Malley of the Connecticut Historical Society about whether linseed oil was used on the cherry furniture of the late 18th century, and he was not aware of any evidence one way or the other. I gather from your use on these pieces that it is a period correct finish and that the finish on Jefferson’s desk would not have been oil under shellac as shellac came along later. Is that correct? Are plans and/or more photos available for the writing desk? “… a couple dozen of coats of seedlac” on the writing table. A couple dozen? This may be a silly question, but why a couple dozen? Is your cut really thin that this is necessary? Well obviously you felt it necessary or you wouldn’t have done it, but I guess what I’m looking for is the benefit you see in working in so many finish coats. To echo Dennis’ comments, excellent and inspiring work (as always). It was a real treat talking with each of you last year as you worked on these pieces. In answer to a couple of questions we’ve had on our finishes, I thought you all might be interested in two of our primary sources. Our tried and true reference has been Stalker and Parker’s, A Treatise on Japaning and Varnishing, 1688. In the chapter on making a seed-lac varnish, they describe adding one and a half pounds of the best Seed-lac to a gallon of good spirits. The advantage we’ve found with these thin coats is the alcohol flashes off quickly and we can apply multiple coats (4 or 5) in one session- if the weather isn’t too humid. The number of coats applied seems to vary based on the quality of the stock. Stalker and Parker recommend that the wood you intend to varnish “be close-grained, exempt and free from all knots and greasiness, very smooth, clean and well rush’t,” meaning the use of equisetum or “horsetail” rushes as a mild abrasive. Once the surfaces were prepared, they “wash” them with roughly 16 to 18 coats total, perhaps 6 more if the surface needed it. Another resource we found, The Builder’s Dictionary, 1733-34, mentions making a drying oil by “adding 2 ounces of litharge of lead to a quart of linseed oil and boil it for near an hour in an earthen pan”, or put the same ingredients in a glass jar in the sun on a hot summer day for a month. Practices would certainly have varied over time and from one region to another. We tend to just use purchased boiled linseed oil at the Hay Shop. Boiling linseed oil in a wooden building doesn’t seem like a good idea.